The second phase of this project was established in June, 2006 by Deepa Banerjee, the South Asian Studies Librarian who joined University of Washington Libraries in 2006. 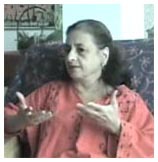 The interviews were conducted by the oral historian Amy Bhatt, a PhD student at the University of Washington. An advisory committee made up of seven individuals from the Libraries and South Asian Community was also established to help select individuals to be interviewed and to guide the second and third phase of the project. What was it like to immigrate here during this period? How did they negotiate them to find success in the United States? How do they view themselves as both South Asian and American today? This group of immigrants demonstrated a high level of civic and cultural engagement, while creating new outlets for cultural concerns and expression. They worked in fields as diverse as engineering, business, real estate, education, medicine, and as homemakers. Their activities ranged from founding continuing music societies such as Ragamala, to organizing classes to teach South Asian languages to children, and creating a political voice for the South Asian community through the Indian American Political Advocacy Council. Far from assimilating, these immigrants have carved out important and visible spaces in the fabric of American society. The men and women interviewed represent a wide range of stories and backgrounds. They include Indians, Pakistanis, Bangladeshis, as well as Hindus, Muslims, and Zoroastrians. Some of the narrators married and created families within their communities, while others chose more divergent paths.